I`m sure that most of us in our schooldays had to undertake essays beginning with `compare and contrast` - in my mind I`d imagine different ways of disposing of certain teachers! 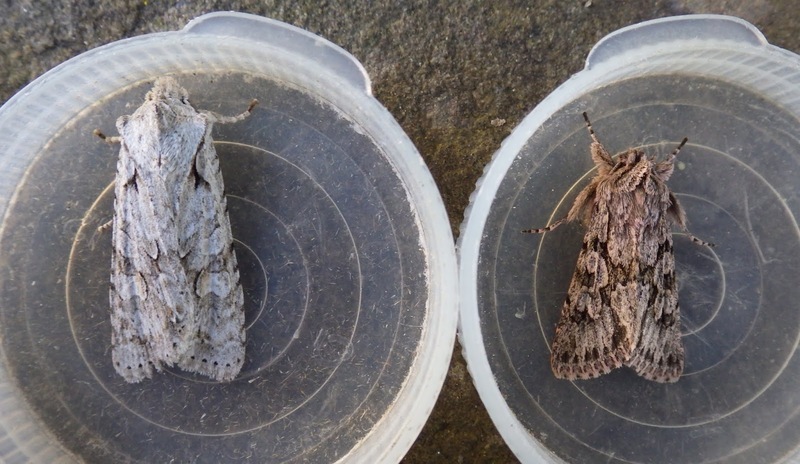 Anyway, following on from last night`s catch, here is a photo of grey shoulder-knot and early grey side-by-side. They are quite different and the early grey exhibits a pink suffusion that is often shown by this moth. Grey shoulder-knot is a species that I`ve only caught c <6 times, so it is quite scarce locally.